Description: In this class you will assemble a kite ball that is about 3 feet in diameter, similar to the small balls in the foreground of the picture. These are excellent ground displays for small children to explore. They perform well on medium and high wind days. Guaranteed to turn any beach into a sunny white sand beach with jungle! Fabric for one pre-cut ball is included with the class. This will probably take about a half day to assemble during which time you will sew lots of curved seams. 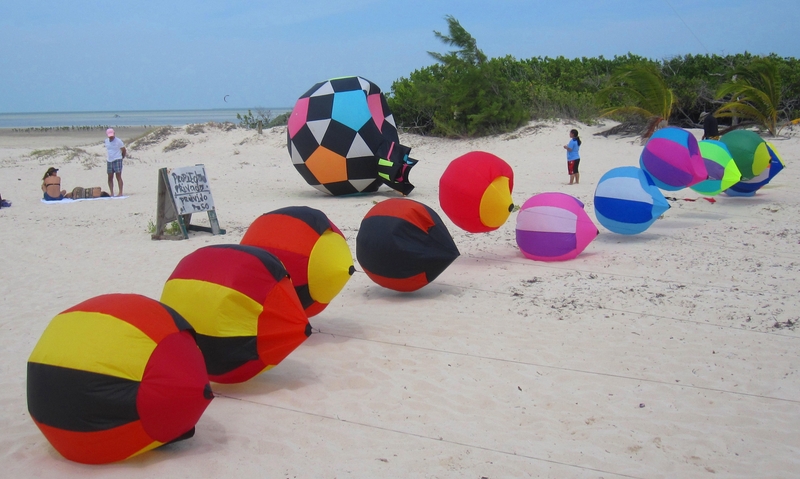 Since kite balls are best flown in clusters, the class is being offered as an all-day class for those who want to cut out and assemble more. Alternatively, bring large paper to trace the templates so you can make more later. 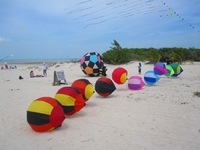 Three fabric colors are typically used per ball. Your color choice might be provided if you contact me before I cut out the cloth. I usually use fibermax 44 for the balls which is available in these colors: http://www.challengesailcloth.com/pdf/Ripstop.pdf. No guarantees. Depending upon demand, I may make a special order of fabric from Challenge. For additional balls there are a few options for cloth: OKR has fabric for sale, I think Deb said there are some fluorescent colors. I will bring an assortment of fabric available at cost. Or, you can provide your own cloth. Each ball requires about 4 yards of ¾ oz ripstop. What to bring: Sewing machine and notions. Large/roll of paper for tracing templates. Fabric for one ball will be provided.